It seems 2018 can’t end soon enough for Apple. It’s been a bad year for the company, and now if this latest claim turns out to be true, things could get even worse for the iPhone maker. 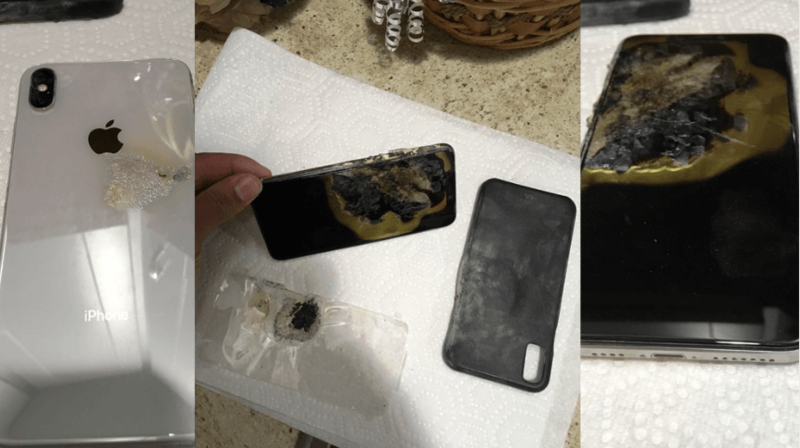 A man in Ohio recently claimed that his three-week-old iPhone XS Max caught fire in his pants. The victim complained about it to Apple but received a lackluster response. He is now considering taking legal action against the company. Josh Hillard from Columbus, Ohio told iDropNews that on Dec. 12, he noticed a strange smell coming from the back pocket of his pants. Then he felt something burning his skin, and green and yellow smoke started to appear. The incident reportedly happened while he was on lunch break at work. He also said that when his iPhone XS Max caught fire, he had to quickly rush to another room to take his pants off because a female co-worker was in the break room with him when it happened. A fire extinguisher was reportedly used to douse the flames. “From the time of first noticing the fire and between removal of the pants and taking the phone out of my pocket and placing it outside, I inhaled A LOT of smoke. Later in the day, the team told me about the video that the office security camera captured,” Hillard told iDropNews. Later in the evening, the man took his burnt iPhone XS Max to an Apple Store, but the response he received wasn’t satisfactory. According to Hillard, store employees questioned him for about 20 minutes, and then he had to wait 40 minutes more while staff members took his phone to a back room. He then asked for his phone back but was told that the burnt phone had to be sent to the engineering team. He was also told that sending the phone to the engineering team is the only way to get a replacement phone. Hillard wasn’t happy with the response he received from Apple Store employees, so he took his burnt iPhone XS Max and went home, where he called Apple Care. He followed up on his complaint the next day, and then he was offered a new phone. However, after spending so much on an ultra-premium phone and then going through all that trouble, Hillard felt that Apple should do more for him, including compensating him for his ruined clothes and other troubles. According to iDrop News, he is also considering legal action against Apple. The images he shared with iDrop News show severe damage to the handset. Almost half of the display is charred and deformed. Significant damage can also be seen on the sides and back of the handset. So far this is the only reported incident in which the iPhone XS Max caught fire. Apple itself hasn’t even confirmed it, so it’s too early to doubt the quality of the new iPhones. In Hillard’s case, long-term battery abuse is unlikely to be the cause of the fire because the phone was just three weeks old. Given how many times smartphones have caught fire despite all the safety precautions and testing, it appears to be impossible to eliminate such incidents completely. Although this is the first reported incident involving the iPhone XS Max, it is not the only fire incident involving iPhones this year. Earlier this year an iPhone 6s caught fire and exploded in Las Vegas. The whole incident was recorded on a surveillance camera. Last month one iPhone X allegedly exploded after it was upgraded to iOS 12.1. The iPhone X in question was about 10 months old. Rahel Mohamad, the phone’s owner, told Gadgets 360 that he was using the original charger to charge his iPhone. He also said that he had stopped charging the phone before it exploded. “When I held the phone it was very hot and I drop the phone immediately. Then it started to smoke.” he told the tech blog. When Mohamad reached out to Apple, he got a reply that the company wanted to investigate the incident and asked him to ship the iPhone X to them. At the time, Apple described the whole incident as “definitely not expected behavior” in a tweet. There have also been several incidents of other iPhone models catching fire in past years, but it has never reached Galaxy Note 7 levels. Samsung had to recall all the phones in that case.